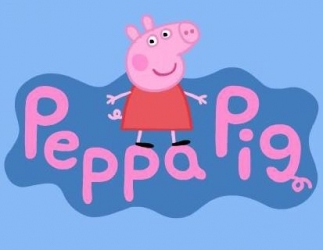 Peppa Pig is a British pre-school animated television series created, directed and produced by Astley Baker Davies (the same team that made The Big Knights and who also make Ben and Holly's Little Kingdom) and distributed by eOne Entertainment. Debuted in 2004 and new episodes are still premiering as of September 2017. The series centers on Peppa and her family and friends. Other characters are other anthropomorphic animals whose names always start with the first letter of the name of the animal they represent. Popular enough in the UK to have an entire section of a children's theme park (Paulton's Park) called Peppa Pig World open in 2011. Its so popular in the UK in fact, it may as well be one of the only shows in history to have episodes premiere in cinemas. No, we're not joking . The massive international popularity of the series resulted in the Chinese release Peppa Celebrates Chinese New Year, with plans for a limited subtitled U.S. release as well. We're not joking about this either. Acquired Error at the Printer: "Mummy Pig's Book" is about Peppa and George getting a record-breaking highscore on "Happy Ms. Chicken" via keyboard spamming, which ends up overwriting Mummy's storybook about a onion who tries to be funny to others. This isn't discovered by Mummy until the book gets released, which starts with the story then jump-cuts (after the first two pages) to Peppa and George's scoreboard. Everyone finds it funny, but Peppa and George know the truth. All Balloons Have Helium: In Mummy Pig's Birthday. Adult Fear: In "London." The playgroup's double-decker bus only barely manages its jump over Tower Bridge, and even then, the bus is left teetering on the edge of its landing. The group has to move to the front of the bus in order to tip it safely onto the road. Even Peppa and her friends agree that they like it when their names start with the same letter as the name of the species they are. For example, in "Mummy Rabbit's Bump", Peppa and some of her friends get to pick out a name for Mummy Rabbit's baby. Pedro's suggestions elicit strong questioning/rejection. Suzy: I don't think so, Pedro. Peppa, Suzy and Rebecca: Michael Rabbit?!? No! Joey Kangaroo averts this trope. However, he still has a Punny Name. Alliterative Title: Peppa Pig. Her friends are also named this way. Alternative Foreign Theme Song: The Japanese version uses "Colorful Fanfare" by ROCO as its theme song. Amazingly Embarrassing Parents: All of the parents featured in "School Play". They all take photos when they're not supposed to, and a few also call out to their children during the play. Americans Are Cowboys: Pedro likes to play cowboy in his spare time, and when he draws America for International Day, he just comes to school in his cowboy outfit. In "George Catches a Cold", George walks into the rain without a hat and suffers the common cold. This is a myth, as cold is caused by viruses, not coldness and wetness. Rosie and Robbie Rabbit are born in a few minutes in "Mummy Rabbit's Bump". In real life, childbirth lasts hours for humans, but this would be about right for rabbits. Artistic License  Paleontology: In-universe - when the kids visit the dinosaur exhibit in Potato City, Edmund Elephant points out that the dinosaurs they have living together didn't actually live in the same era. The kids also basically get the attendant of the dinosaur exhibit to admit that the only reason they have a dinosaur exhibit at Potato City is because Everything's Better with Dinosaurs. A Wizard Did It: Played With near the end of "Shopping". A chocolate cake is scanned, and it turns out it wasn't on the list. Daddy Pig confesses to getting it off-screen despite not being clearly shown in the cart. Baby's First Words: Peppa's first word was "Mummy", George's was "dinosaur" and Alexander's was "puddles". Beeping Computers: In "The Library," when Daddy Pig's library book is scanned in as ten years overdue, the library computer actually sounds and flashes a siren and displays a frowny face. Bigger on the Inside: Peppa's house looks to be about four or five "Daddy Pig"s across when they are standing outside of it. Plenty of room indoors, though. Blah Blah Blah: "That's how daddies talk." Blind Without 'Em: Daddy Pig & Pedro Pony. When both lose their glasses in separate episodes, they have a hard time telling what's what and who's who. Bumbling Dad: Daddy Pig can be this when he doesn't exactly know what he's doing. Captain Obvious: The Narrator normally makes unneeded comments on what's happening. Justified as the show is aimed at young children. Carnivore Confusion: Subverted in "The Zoo." Mr. Lion, a guide at the zoo, keeps calling Madame Gazelle a wildebeest, and it seems as though he could be compelled to eat her at any moment. Characterization Marches On: When first introduced in her introductory episode, Emily Elephant was shy and modest, however in the same episode onwards, after winning a loud animal sound making contest on recess, she has become more cheerful and outgoing. Cheated Angle: The characters only ever face in two directions and both eyes are always on whatever side of their face is facing the viewer. Child Prodigy: Edmond Elephant is "a clever clogs." and knows a lot of random facts. He also is two but has perfect speech. Christmas Episode: "Santa's Grotto" and the follow-up "Santa's Visit" are about Christmas (and Santa). The Cobbler's Children Have No Shoes: Related: Pedro's father is an optometrist, but Pedro is the only child that needs glasses. Cool Old Lady: Madame Gazelle is old enough to have taught the parents, plays a mean guitar, used to be in a band, and was a world champion skiier. The Queen isn't too uptight to join in a round of jumping up and down in muddy puddles , and she drove the playgroup's double decker bus over Tower Bridge during their tour of London. Creative Closing Credits: Anytime a character or characters sing a song with a story, it will generally be reprised during the closing credits, instead of the normal theme tune instrumental. Cue the Rain: In the "Thunderstorm" episode, after Daddy Pig says "Plenty of time before it rains." In the Spain Dub, When Richard cries, he sounds like he's shrieking. Baby Alexander's wailing is loud enough to be heard from quite a while away. Although it's justified, since he is a baby. Danny Dog's father has been sailing around the world. Suzy Sheep's father is never seen or heard of. Everybody Laughs Ending: Often laughing so hard that they are all on their backs. Everyone Went to School Together: Madam Gazelle taught the parents of all the kids in Peppa's playgroup, as well. Peppa and her friends get to see the time capsule their parents madee after burying one of their own. Fainting: Miss Rabbit gets so nervous when meeting The Queen that she does two emotional faints. Fantasy Helmet Enforcement: In a variant, in the first two series, Peppa, George and friends are not seen wearing seat belts in their car, OR wearing bike helmets. From 2009 onwards, all characters appear with both in requisite situations and the creators of the show took the retroactive remedy of editing all older episodes to also feature belts and helmets where applicable. Fat and Proud: Daddy Pig. He doesn't see the point in being fit and is fond of his fat belly (though he believes it to be pure muscle). "Fawlty Towers" Plot: In Daddy Pig Puts Up A Picture, Daddy Pig accidentally breaks the wall when trying to put up a photo of Peppa and George. He manages to mend it before Mummy Pig returns and notices it, and he and the children pretend nothing's happened when she ends up putting up the photo herself. Filthy Fun: Exaggerated. Everyone in this show, even the civilised/clean characters, enjoy muddy puddles. Flanderization: Mr Potato started off as a character from a ordinary (possibly CGI in-verse) kids shownote It is shown that the they spoke through Pokémon Speak. Since "Mr. Potato Comes to Town", he has become the local celebrity of Peppa's hometown from opening a theme park, hosting a Christmas stage show, getting a superhero movie, hosting a muddy puddle jumping competition and his show, well it transformed to a educational one (as he was once shown acknowledging Ms. Rabbit's jobs on TV). Furry Confusion: Among a cast mostly made up of Funny Animals, there's a family of normal ducks. Also, Gerald Giraffe and his family are anthropomorphic, but Gerald's father is a zookeeper for normal animals. The episode in which Peppa and her friends go to the zoo is full of this. Peppa and her friends meet Mr. Lion who looks after the tortoises, Mrs. Crocodile who looks after the penguins, as well as Gerald, who looks after the butterflies. Madame Gazelle is freaked out by both Mr. Lion and Mrs. Crocodile at first, then relaxes when she realizes they aren't wild animals. Furry Reminder: This show likes this trope a lot. To start off, the animals make their species' noises frequently, Peppa Pig and her family enjoy jumping in muddy puddles, and the Rabbit family lives in a burrow. Peppa and George hear an in-universe story with this kind of plot, about a red monkey going to bed. Peppa finds the story boring, so she's pleased to find more interesting books featuring the same monkey at the library. In-universe, Daddy Pig once makes up a bedtime story about a royal family going to bed, called "The Sleepy Princess". Have You Tried Rebooting? : It almost always works. In one episode, Grandpa Pig does this to his broken computer, which announces that it is now even more broken. In "Basketball" when Emily Elephant holds the ball with her trunk instead of her hands, making it so the other kids can't reach it, Peppa starts complaining that that isn't fair. Then Suzy Sheep reminds her that Emily is on their team, at which point Peppa decides it is fair. In "George's Birthday" when Peppa complains to Mummy and Daddy that George woke her up early, they remind her that she did the same thing to George and them in "My Birthday Party". Peppa declares that that was okay because it was her birthday. In the episode where they wash Daddy Pig's shirt, George says he doesn't like pink, which is weird because he is a pink pig himself. In The Golden Boots, Peppa insists that her boots are "golden," but Suzy feels that they're simply "yellow." They get into an Argument of Contradictions about it. I Want My Jetpack: In "The Time Capsule", in the old VCR showing Peppa Pig and friends' parents as young children, Daddy Pig suggests that in the future, people will be living on the moon. That's the same thing Peppa and friends think the future will have. Peppa Pig: Silly little Daddy Pig. Kids Prefer Boxes: George ended up playing with the box instead when Daddy Pig and Grandpa Pig took too long setting up the fancy electronic car he got in the Christmas episode. Kitchen Sink Included: in one episode, the pig family rents a camper van with dashboard controls for everything, including the sink. Large Ham: Grampy Rabbit, who is overly eager and over-the-top at anything he does. Helps he's also played by BRIAN BLESSED, who is quite a hammy actor himself. Leaving Food for Santa: In "Santa's Grotto", Grandpa Pig leaves Santa a mince pie and an unspecified drink. Given British tradition, it was probably sherry. A carrot is also left for Santa's reindeer. Let's Meet the Meat: Mr. Potato is a large sentient potato, but still encourages children to eat fruits and vegetables. Longest Pregnancy Ever: Inverted. Due largely to the show's typically short episode runtime note of five minutes, Mummy Rabbit is literally pregnant for four minutes of screen time. "[Character] likes [what is currently happening]. Everybody likes [what is currently happening]." Minimalist Cast: In the first episodes, Peppa and her family were the only characters who appeared. Later seasons added more characters. The series never says where it is set. It is supposed to be somewhere in the UK, but things like high, alpine mountains, which aren't found in the UK, appear. Also in most foreign dubs, the dub will change the setting to where the dub takes place. For example, the Brazilian Portuguese version is supposed to have the series set in Brazil despite the fact snow-topped mountains and hills lined with temperate climate vegetation appear. Narrating the Obvious: Taken to extreme levels. After a character tells us what is going on, the narrator tells the audience all over again. New Job as the Plot Demands: Miss Rabbit doing every random job going is a running joke. Firewoman, supermarket checkout, museum shop, bus driver, train driver, Christmas tree sales ... Lampshaded in "Miss Rabbit's Day Off", in which everyone has to fill in for all her jobs, and in "The Queen" in which Miss Rabbit receives an award from The Queen for being 'The Hardest Worker In the Land'. Apparently played with in the episode where she is about to give birth. It is revealed that in fact, Miss Rabbit is also a Nurse that works at the hospital and that her-never-before-revealed sister, Mummy Rabbit, is the one that gives birth. The book Peppa Pig and the Career Day also has fun with it - Miss Rabbit goes up in front of Peppa's class five different times before, after and in-between all of the other adults that present their jobs. No Ending: "Boomerang" (the final part of the Australian Holiday) ends with Peppa and Kyle discussing how the holiday was going so far, ending with the narrator stating that they have had "the best holiday ever". Cue ending credits, thus not giving a "returning back home" episode as with the Italian Holiday 4-parter. Ocular Gushers: The infants (most often George) cry a shower of tears a lot in the show. Peppa gets in on the action after her golden boots are taken by a duck in the special "The Golden Boots." Parental Bonus: There's quite a few jokes which are too subtle to be picked up by children, but an adult can find it mildly humorous, mostly delivered by Daddy Pig and Grampy Rabbit. Pluto Is Expendable: Pluto is excluded when the planets are mentioned at the museum. Recycled Soundtrack: Justified Trope. Richard Rabbit and George are both two years old. They don't have much of a vocabulary. George's obsession with dinosaurs. "George, you always say 'dinosaur'!" Jumping up and down in muddy puddles because "everybody loves jumping up and down in muddy puddles." Even the adults. Daddy Pig climbing in trees to get something, then falling out of them. Lampshaded at least once by Mummy Pig. Whenever the Pig family goes, there's inevitably going to be a gift shop run by Miss Rabbit. Whether it be a museum, a scenic spot, a decrepit run-down shack on an overgrown path to a pond with fish Daddy Pig visited as a child, even on the surface of the moon. Subverted during the pig family's trip to Italy, where Miss Rabbit works as an airport clerk and stewardess, but a goat runs a local gift shop. On every leg of her family's vacation in Italy, Peppa leaves her teddy bear behind, and a police officer returnz it to her. Grampy Rabbit asks everyone if they want to hear a song. The adults say no, the kids say yes, then he sings it. Santa Claus: In "Peppa's Christmas," both Peppa and George get to meet Santa. The episode seems to imply that the only reason Santa goes up and down the chimney is because he never thought of simply using the door. The vocal credits for the episode list "Father Christmas as himself." School Play: Peppa's class acts out Little Red Riding Hood for the parents. Then Pedro develops Performance Anxiety; Madame Gazelle joins him on stage. The trip to Grampy Rabbit's Dinosaur park has Grampy Rabbit welcoming everyone in the manner of Richard Attenborough in Jurassic Park. An extremely bizarre one: in "Peppa's Christmas", a bunch of cards hanging near the ceiling can be seen occasionally - and one of the cards blatantly has a picture of Haruhi Suzumiya, a Japanese character from the popular light novel and anime series with the same name. When the Queen lands the bus on the edge of the bridge and it wobbles there, her line Hang on a moment, lads, Ive got an idea is the final line of The Italian Job. Sick Episode: Three of them. In Pedro's Cough, everyone catches a cough that is instantly cured by a yucky pink liquid. In George Catches a Cold, it's Exactly What It Says on the Tin, invoking Catch Your Death of Cold, and in Not Very Well, Peppa gets an undefined rash. Species Surname: All the characters' surname are their species, such as Peppa Pig who is a pig. Suddenly Bilingual: In "Pen Pal" it suddenly becomes known for no particular reason that Mummy Pig can speak and understand French, and she uses her knowledge to help Peppa talk to her French pen pal Delphine. Her knowing French isn't mentioned again after the episode. Surprise Party: One is held for Madam Gazelle in "Madam Gazelle's Leaving Party" as a leaving party for Madam Gazelle because she had said that she was leaving. The whole thing is a misunderstanding of Peppa's; Madam Gazelle is only going to be gone for a week for a holiday. She even said "no playgroup next week," but Peppa didn't understand. Everybody else believed her because Everyone Went to School Together and so they know Madam Gazelle might be at the point where she'd want to retire. Surprisingly Good Foreign Language: In "Pen Pal", Peppa gets a French pen pal who she also talks with on the phone and later meets. It transpires that Mommy Pig is fairly fluent in French. Daddy Pig claims to be, but is actually awful. Take That! : In "International Day", the kids dress up like people from different countries. They start arguing. When Madame Gazelle asks if they think that actual countries behave like that, Peppa says "Don't they?" Talk Like a Pirate: In "Danny's Pirate Party," Peppa and her friends attend a pirate-themed birthday party dressing up as pirates (except for the offbeat Pedro, who has dressed like a cowboy), and Granddad Dog gets in on the fun by dressing up as a pirate also and asking to be called "Dogbeard." However, when he talks like a pirate trying to explain a game he's made up, the kids can't understand him, forcing him to speak more normally. Dogbeard: Here be the plan. Time was, I had a heap of gold was mine by right, but I was hornswaggled by one Captain Hog. Narrator: Pirate talk is a bit difficult to understand. Dogbeard: Captain Hog took my treasure. Tempting Fate: Daddy Pig gives Mummy Pig a hard time about flipping pancakes too low. When he gets his chance, it gets stuck to the ceiling. Tertiary Sexual Characteristics: Every female character wears a dress. On the other hand, the boys have some sort of unspecified clothing... drawn as a simple round shape. "Test Your Strength" Game: One of these appears in the episode "Funfair". After Mr Bull, who is manning the game, makes a rude remark about Daddy Pig's weight, Mummy Pig (who has had sexist remarks doubting her skill made to her by characters manning fairground games) is pushed over the edge. In a fit of rage, she whacks the button so hard it hits the bell five times, winning her all the giant teddies at the fairground. Peppa, her classmates and Daddy Pig play a lively rock-and-roll version of the theme tune in "Shake, Rattle and Bang" to end the episode. The same tune is then played over the closing credits. In the beginning of the episode "Whistling", Daddy Pig whistles the theme tune while he reads the newspaper. Peppa hears this and spends the entire episode trying to whistle (and getting dismayed by the fact everyone else can.) By the end of the episode, Peppa figures out how to whistle, and the tune she whistles is, of course, the theme tune, which is shortly lampshaded by Mummy Pig ("What a lovely tune!"). Through a Face Full of Fur: Rebecca Rabbit's face goes really red when blushing despite her fur, and she does it all the time. Token Human: There are at least two humans in Peppa's world: Santa Claus and Queen Elizabeth II. Unnamed Parent: All of Peppa's adult relatives are like this. So everyone calls Peppa's father "Daddy Pig", even his wife, his coworkers and his own father-in-law. Verbal Tic: Everyone. The Pigs snort after every other sentence, while friends of other species sometimes emit their best known sound. Vitriolic Best Buds: Grandpa Pig and Grandad Dog. They're always bickering saying that each other's boats are old and rusty for a few seconds, but in the end they make up with the Narrator saying "Grandad Dog and Grandpa Pig are very best friends". Wacky Cravings: In "Mummy Rabbit's Bump", a pregnant Mummy Rabbit asks for potatoes with jelly, cheese, and strawberry jam. Peppa and friends are appropriately disgusted. Narrator: A potato with jelly, cheese, and strawberry jam? What a funny mixture of food! What Are Records? : Averted. When Peppa and George find a record player in Granny and Grandpa's attic, both seem to immediately recognize what it's for and Peppa asks them to play the record that they found with it. Mr. Rabbit: Is it a boy or a girl? Mummy Rabbit: Both! (brings up two crying babies) We've got baby twins! World of Funny Animals: All the major characters are funny animals. Yes, Virginia: "Peppas Christmas" has Peppa and George meeting Santa. The others believe in Santa but they initially don't believe that the two got to see him. You Talk Too Much: Doctor Brown Bear implies this about Grandpa Rabbit. When he's called up because Grandpa Rabbit lost his voice, he first asks if that's a bad thing. Additionally, in "Chatterbox," when Suzy Sheep wants to tell Peppa about her day, but Peppa just keeps talking and talking instead, she tells Peppa "You talk too much. You go 'blah blah blah blah blah.' Just like that. 'Blah blah blah.'"